If you’re a remote employee or freelancer, these 12 productivity tips can help you boost efficiency throughout the day — even through the midday slump. Strategic scheduling helps remote workers stay productive and on track. It’s easier to work when you understand that you have to be productive from 9 a.m. to 12 p.m. or whatever schedule you decide on. One great perk about remote work is that you get to choose your hours, so if you enjoy sleeping in and are more productive in the evening, you can set your working schedule to be from noon to 8 p.m. You just have to determine when you are most productive. Sticking to a productive schedule also forms good habits, so you get used to churning out quality work for at least a few hours every day. Mentally clock yourself in and out of work each day to give yourself a boundary between work and home (even if they utilize the same space). Even though you should work within a schedule most of the time, don’t forget to give yourself a break every now and then to stay productive. If you end up spending a day procrastinating, get over it and get back on track the next day. 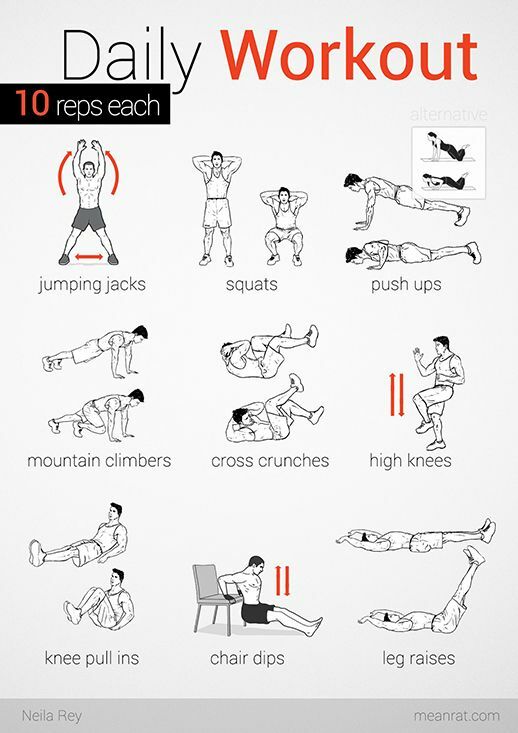 You should also establish a few routines throughout the day to keep you moving even if your schedule gets thrown off. For example, you could develop a work ritual to signal the beginning of productive time. This could be lighting a scented candle, starting a playlist or sitting at a certain desk. Once your routine gets started it’ll be easier for you to fall into a rhythm. 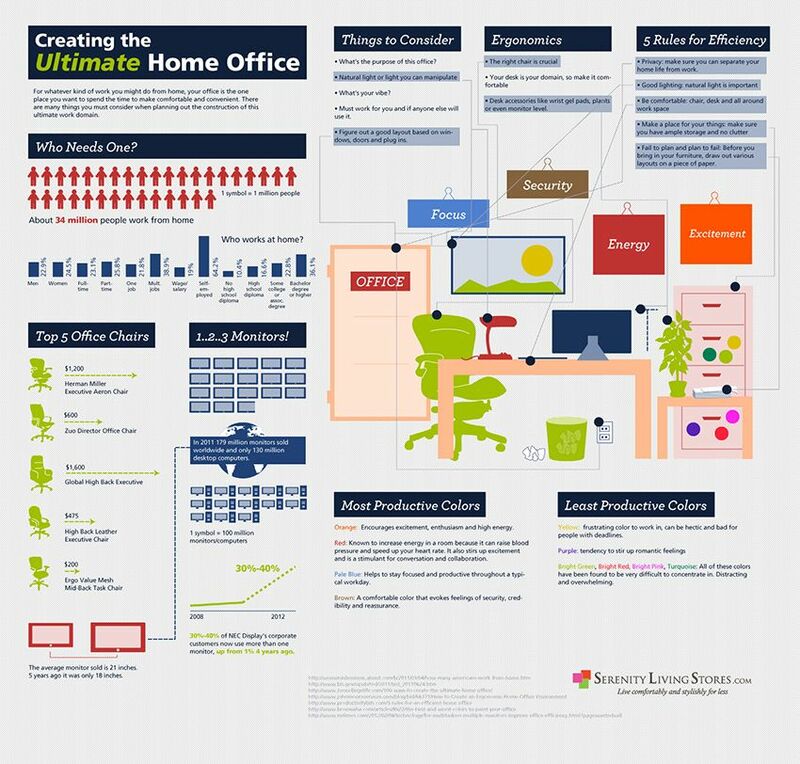 As mentioned above, one of the most important reasons to set schedules is to establish a line between home and work. Setting work boundaries is simple once you learn your rhythm. A few tips to separate your personal and professional personas are to set physical boundaries, declare your working hours, and make sure your colleagues, friends, and family know your schedule. 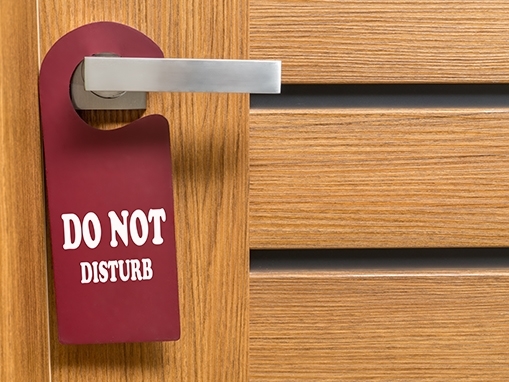 You can also try posting a sign outside your door to establish when work is taking place. Working in your pajamas feels amazing, but may not be very good for productivity according to this article on why to dress up even when working from home. You don’t have to put on your business best, but do get out of your comfortable house clothes to make it clear that you are no longer lounging at home, but going to work. According to a Business Insider article, working in pajamas is the one thing freelancers shouldn’t do. Marla Tabaka says that you will feel and act more professionally if you are dressed for work. In 8 Ways to Be Happy and Productive in Your Home Office, she says not to get lazy about how you look, even if the postman or the pizza delivery guy is your only visitor. Tip: Invest in a nice, comfortable pair of black slacks that you can easily slip on in the morning. They’ll be easy to pair with different tops. Get out of the office and take some time to go to lunch, order some food, take a walk and generally get some fresh air to recharge before getting back to work. It’s easy to get stuck in front of a monitor all day, but it isn’t necessarily good for your productivity. Try to leave the house at least once per day to grab a drink or take a walk and avoid cabin fever. Taking breaks is great for productivity because they keep us from getting bored with our work, then help us come back and refocus on a problem with a fresh set of eyes. Experiment with your own ideal break times, but you can start with 57 minutes of work and a 17-minute break, as recommended by The Atlantic. Or, if you don’t like going outside to work, be sure to grab some plants for your home office. Office plants can boost productivity up to 15 percent! Research the plant choices available to you and get one (or two) that doesn’t need too much maintenance and won’t attract a lot of insects. Tip: If you want to get out of the house but don’t have time for a break, take your work to a nearby cafe or bookstore where you can work. Check out websites that recommend the best coffee shops, bars and other places to get work done. Have you ever tried getting some serious, high-level work done while there was construction going on across the street? Imagine the sound of drills and hammers while you’re writing an article or designing a logo. It isn’t pretty. You can purchase a noise-cancelling headset with a mute button, or you can use ambient noise. According to an article from 99u, a moderate amount of ambient noise helps creativity. Ambient noise can help you create a working space where you can focus and distance yourself from the hustle and bustle going on right outside your window. Here are a few websites that provide some great background murmur for work. 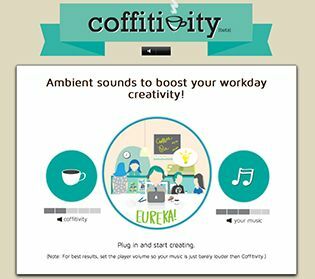 Coffitivity has the sounds of coffee shops, university cafeterias and other bustling places where work gets done. Rainy Mood provides the soothing sounds of rain and thunderstorms as a backdrop for work. Noisli allows you to mix and match different sounds to get the perfect harmony. Keeping yourself healthy is as important for productivity as actually buckling down and starting the work. Pay attention to what you eat and stock your kitchen with healthy snacks and meals. Remember how we talked about scheduling? Pencil workouts into your schedule and use your job flexibility to make it to the gym when it’s least crowded. Sitting all day is pretty bad for your health, so make it a point to get up and move around every hour. You can set a timer to go off when it’s time to stretch. Tip: Take naps when needed, they’re better than caffeine for waking you up and have a lot of other benefits (see tip #9). Your back will thank you for investing in ergonomic chairs and furniture. Your chair should keep your back properly aligned and prevent slouching. Your monitor should be eye level, meaning you shouldn’t have to look up or down to see your screen, since that could strain your neck. Tip: Get a standing desk so you can do at least some of your work on your feet and shift between the two desks when you get bored at one. Don’t forget to keep your desk organized! In a remote team, everyone has to default to using technology to collaborate and get work done well. You can take full advantage of a new world of amazingly useful project management tools that can boost your productivity and help keep all your tasks organized in ways you never dreamed of. Many of these online tools are at your disposal as a remote worker, so all you have to do is take your pick based on what you want and need. Below are some of the tools that we use at Hubstaff. Trello for our marketing team communications. Hubstaff for all time tracking and productivity monitoring. Skype for team and one-on-one meetings. Jing for on-screen tutorials and visual learning. Here are a few more tools that are useful for remote workers. Timezone.io to find out what time it is where your team members are. Wunderlist to keep checklists and to-dos for work. Freshbooks to keep track of your accounting. DropBox to store and share files. Check out a giant list of even more awesome tools that integrate with Hubstaff. 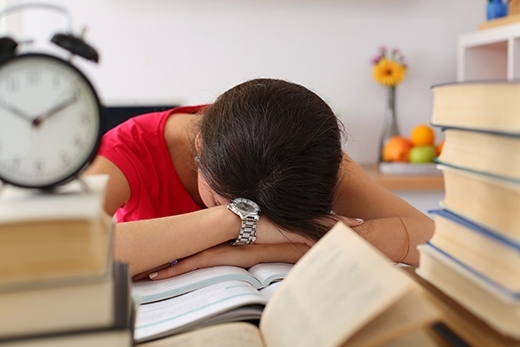 Turns out, napping at work boosts productivity. Luckily, naps are much easier to take when you’re working from home. A short, 10- to 20-minute nap can boost alertness and energy and an hour nap can help improve memory and recall. If you want to get a full sleep cycle in, nap for an hour and a half and you’re more likely to wake up alert and ready to work, without the grogginess. Napping can also help reduce your risk of heart disease and heighten sensory perception. Try to take a nap at the same time every day so your circadian rhythm can get used to the pattern and help you fall asleep more easily. When you work from home it’s easy to let you job consume your life. There’s no quitting time where you can go and have fun with friends or join a club. Taking up a hobby will give you the separation between work and personal life, and may very well help keep you sane. Many remote workers need hobbies to pull them away from work and to help them avoid burnout. Try joining local or online communities to get yourself out of the house. Invite some friends to join you and make sure you keep going to pottery classes, wine tastings or anything else that provides some fun to balance out the work. Even if you aren’t working from home, there’s the constant threat of distractions to ruin a productive streak or workday. It’s important to eliminate distractions so that you can make the most out of your working hours. Here are a few tips to stay focused and productive all day. Avoid getting distracted by some of your favorite websites by blocking them with StayFocusd or Cold Turkey. Set up a specific time to answer emails and don’t check your inbox constantly. It’s also a good idea to avoid emails first thing in the morning so you can get your high-level tasks done before you’re pulled away by email requests and small jobs. If you have a team chat on Skype or Slack, designate some quiet times so everyone can focus on work instead of reply to different messages. One great thing about working in different time zones is that your team’s working hours overlap, but not completely. That means you have a few quiet hours of work every day when everyone else is asleep or off duty. Track your time with Hubstaff and begin work right when you start your timer. At the end of the day, you can see how much time you were productively working by looking at your screenshots and activity levels. Hubstaff also tracks apps and URLs so you can see where you’re spending your time. Finally, acknowledge that you will never run out of work to do. It becomes even more apparent when you work from home and find yourself in front of your computer at midnight with a dozen more things to do. So, in order to guarantee you make the best of your time focus on getting the important things done on time by prioritizing your tasks. 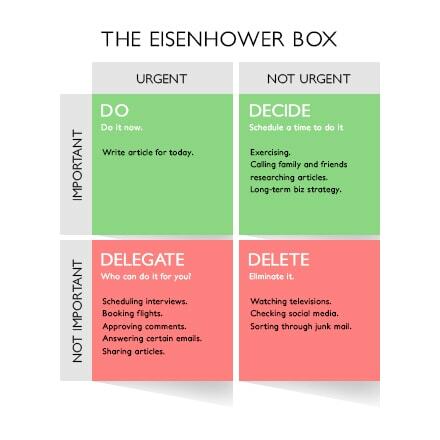 You can determine what tasks you need to do now by using the Eisenhower Box method. This method helps you prioritize tasks based on how important they are and how urgent they are. The image to the right is an example of the Eisenhower box from the website of James Clear. Tip: Before putting something on your to-do list in line for prioritization, determine whether you actually need to do it. For example, programming something for the blog may be important, but it will also be time-consuming. If there’s a free app out there that does the same thing, save yourself the time and use the app instead. The points above are just some of the suggestions we have for making remote work more productive and enjoyable. 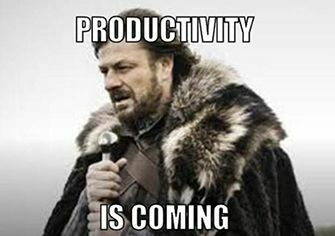 What are your favorite productivity tips? We’d love to hear your thoughts in the comments below.